Iran is a country with a population larger than the UK and an economy worth more than $400 billion annually. The lifting of the sanctions in Iran is a significant opportunity for businesses around the world, unlocking hundreds of billions of currency currently in blocked bank accounts. This can be used to kick start the economy and some estimates suggest that this could lead to a doubling of the growth rate within one year. Iran is rich in natural resources, particularly oil and gas and companies are queueing up to partner with the former rogue state to do business. The lifting of sanctions creates a perfect storm, with countries around the world competing to help re-energise an economy that has been flattened by years of international condemnation and actions, driven by an injection of newly released cash that can finally be combined with international investment to unleash scarce natural resources that the world demands. Yet organisations that consider Iran as new business may still face issues. The Basel Institute on Governance ranked Iran as the highest country in terms of risk rating for money laundering and terrorist finance. Even with the lifting of restrictions on trade, the country remains an incredibly difficult place to do business without risk of breaching Anti-Money Laundering and Anti-Bribery & Corruption regulations. The importance of a proactive and effective due diligence programme remains critically important for businesses trading in the country. 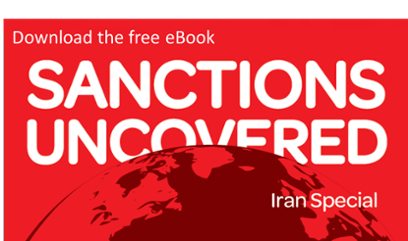 LexisNexis has created an ebook 'Sanctions Uncovered' that outlines some of the issues around the potential lifting of sanctions in Iran and what this will mean for businesses that wish to trade in the country but still need to remain compliant with global trade restrictions. The ebook provides information on the business opportunity afforded in Iran, a checklist of good practice around complying with international regulation when trading overseas, particularly in high risk territories and examples of some of the high profile companies that have fallen foul of sanctions legislation in the past. The ebook can be downloaded below.